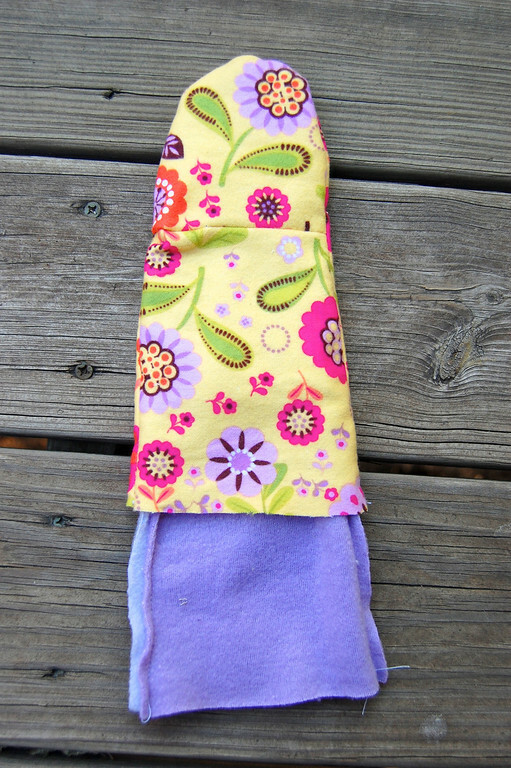 Here's something I've wanted to make ever since the end of summer - mittens for the kids. Note that these are not winter mittens - it gets so cold here in January that we wear ski mittens with thinsulate and waterproof nylon or else our fingers die. These are just hand-warmers for early winter/late fall before the first snow, or when sitting in the cold car on the way to school. 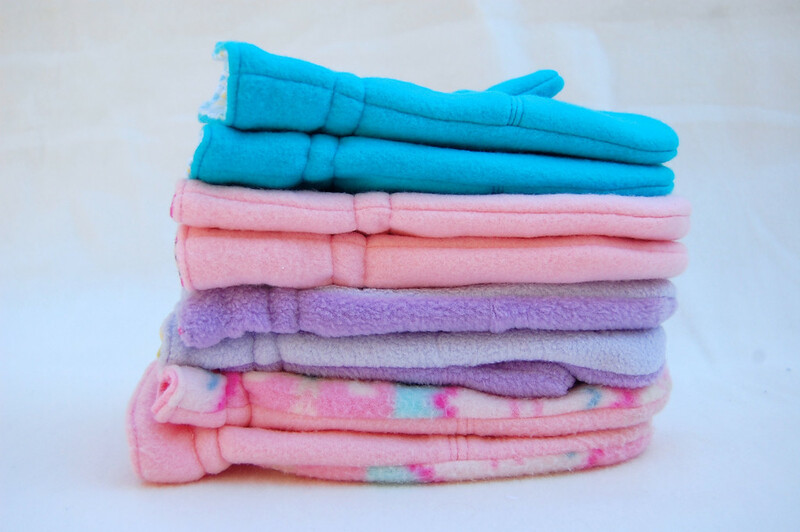 They are fleece on the outside, lined with flannel on the inside. A good way to use up fleece and flannel remnants, for one. 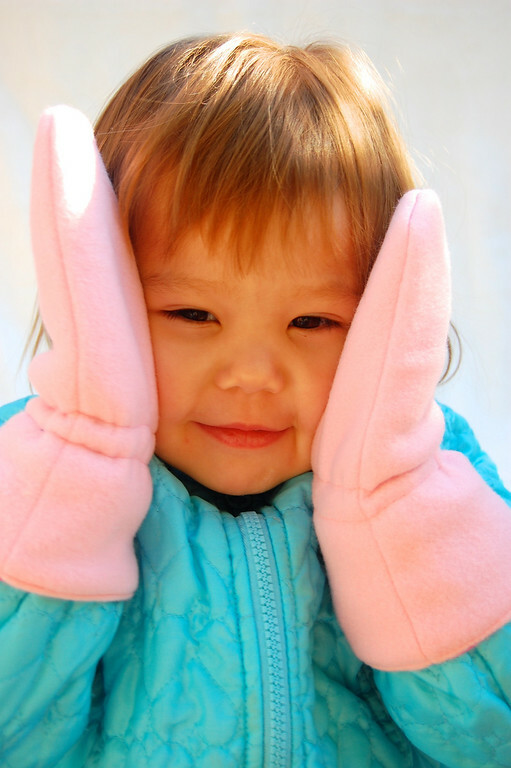 And the mittens we now have for the younger kids end just at the wrist and never stay on. It takes me forever to get them on wriggly hands, and about two seconds for them to pop right off. You could say I made them out of desperation because I was tired of putting them back on again and again. So three pairs of mittens - one for each of the kids. Depending on their age (and thus, their ability to keep said mittens on), I made them to fit at the wrist or over the cuff of their jackets. It was a simple adaptation - making the mitten cuff wider/narrower/shorter/longer and positioning the elastic higher/lower. 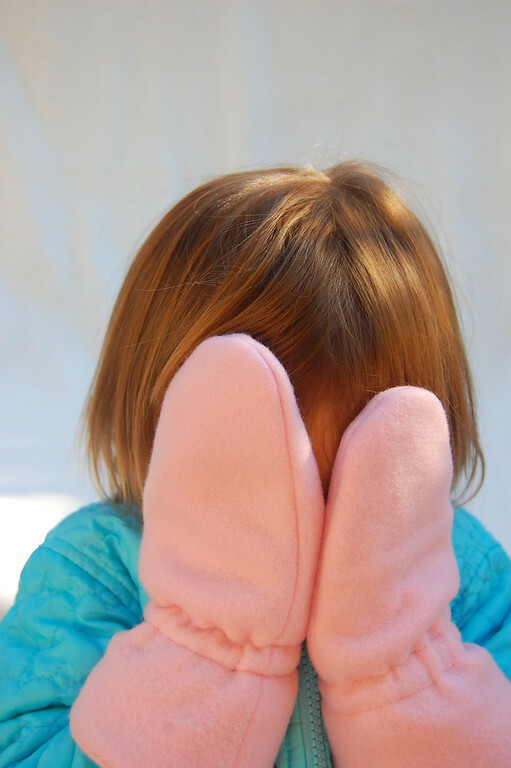 They're so easy to make - I made my patterns by tracing around my kids' hands. Here's my pattern, if you'd like to copy it - just click on it as usual, and it should load at full-size (8.5" x 11"). All three sizes are on it - just follow the key at the bottom of the page for which size to cut out. Don't forget to add your own seam allowances. 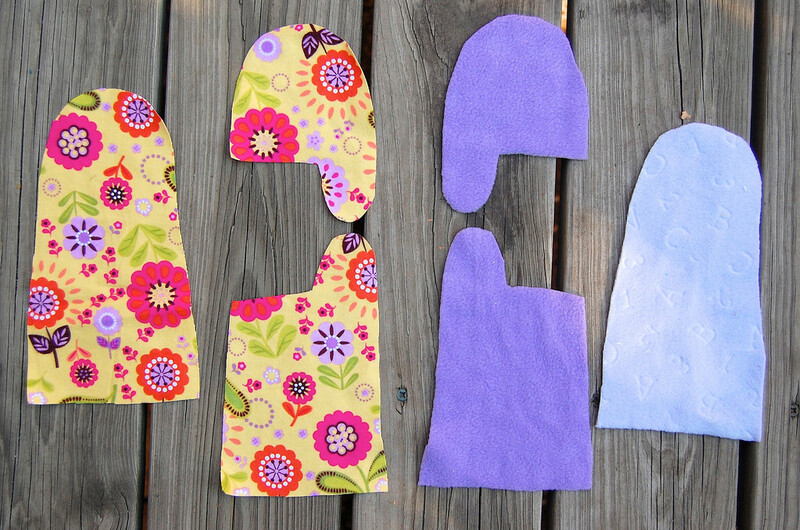 For each hand, cut one piece of each shape in outer fleece and inner flannel fabrics. Note that the lining pieces and the outer pieces are mirror images of each other. 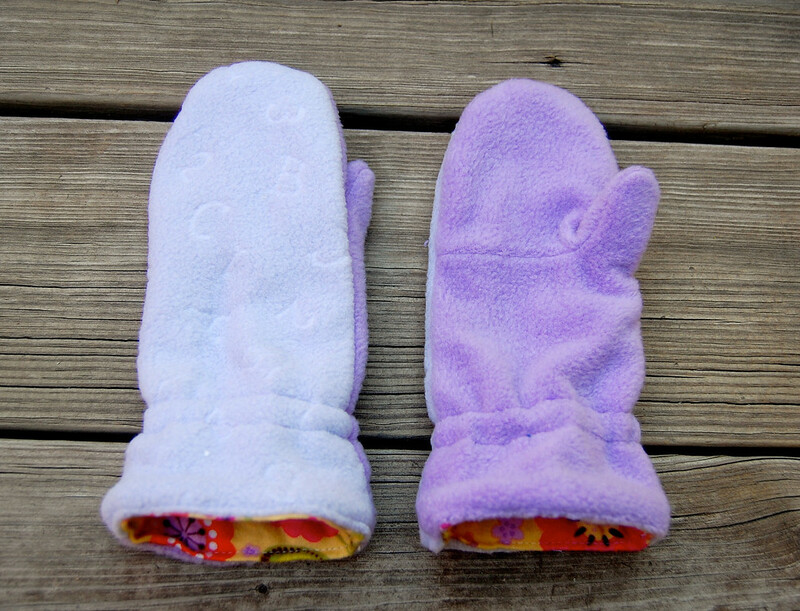 The shorter pieces are the front of the mitten (the palm). The longest of all the pieces are the backs of the mitten, which we will ignore for the first few steps. Place the shorter lining pieces together right side to right side, lining up the sticky-out thumb bits, as shown. Do the same for the fleece pieces. 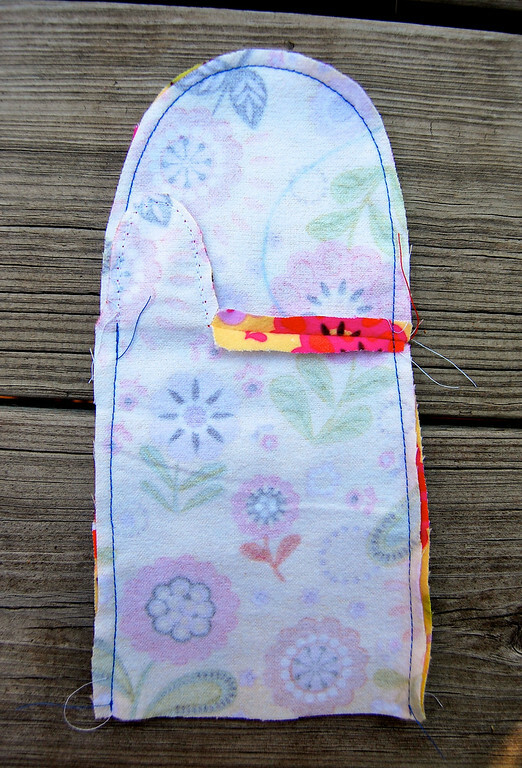 Trim the seam allowance around the thumb to about 1/8" to prevent bunching. Open out the entire front piece and lay it on the back piece, right sides together. 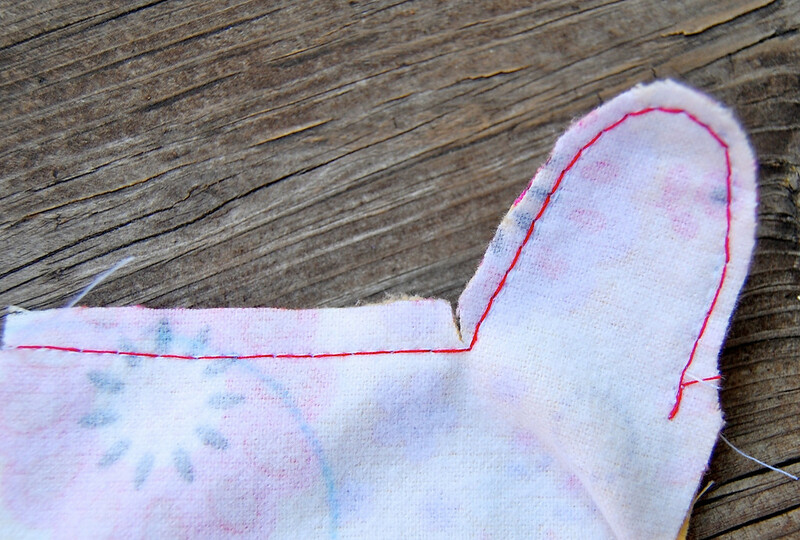 Fold the thumb bit down and sew along the blue line in the photo. Start where the red stitches of the thumb begin, go all around the fingers, down the right side of the mitten, and to the bottom hem. 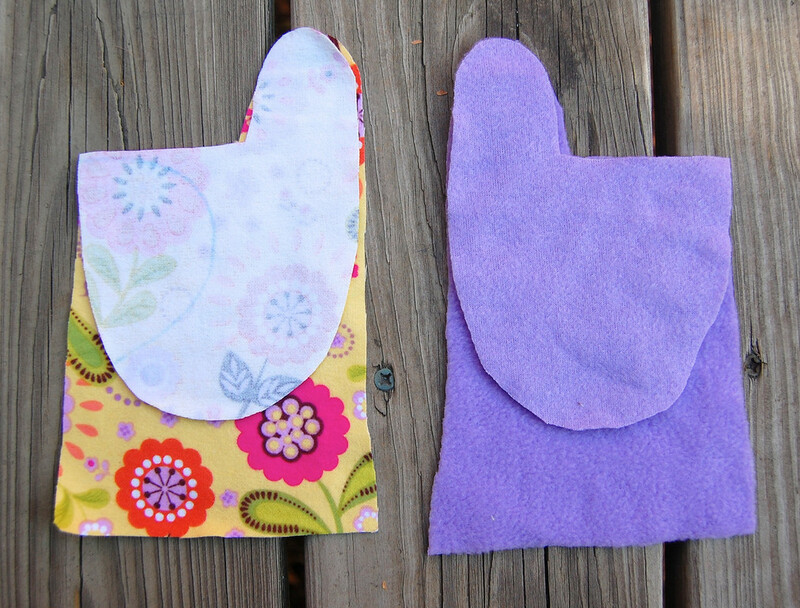 Flip the thumb up and sew from where the white stitches on the thumb begin, and sew down the left side of the mitten to the hem. This is the completed mitten lining. Repeat Steps 3-8 for the outer fleece pieces to make the outer mitten. With the outer mitten still wrong side out, fold down the cuff to where you want the elastic to be (no, it's not marked on the pattern because it's different for every child). 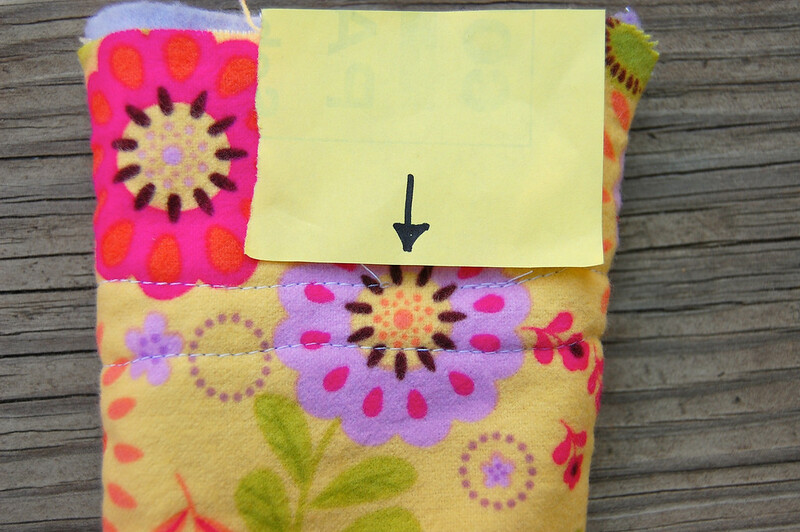 Use a fabric marker or tailor's chalk to mark this fold line all around the fold. 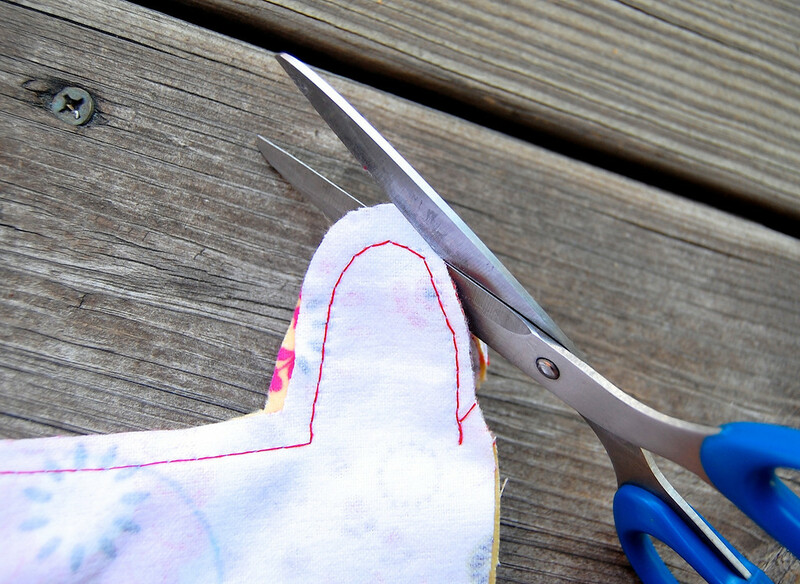 This will help you sew straight lines later. Turn lining right side out. 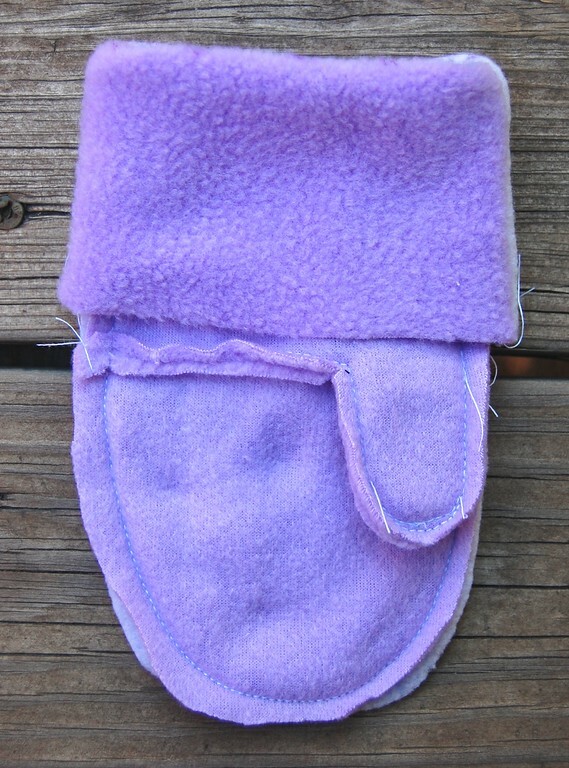 Leave the outer mitten wrong side out, and insert into the lining. Push the outer mitten all the way in until their hems (bottom edges) line up. Make sure the thumbs are on the same side! Fold back the layers to expose the opening and insert about 7" (longer or shorter as preferred) of 1/4" elastic with a safety pin into the elastic casing. 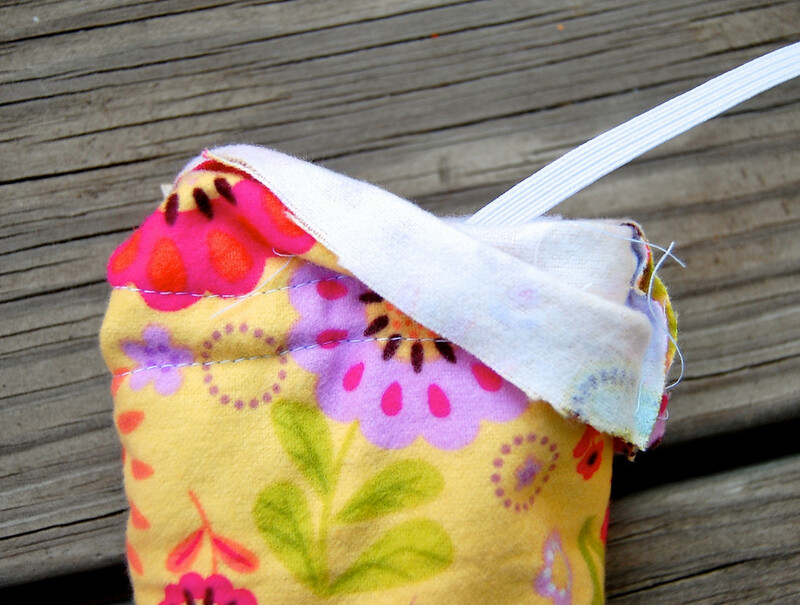 Sew the ends of the elastic together, fold back the layers of fabric and sew the opening closed. Repeat everything to make a mitten for the other hand. 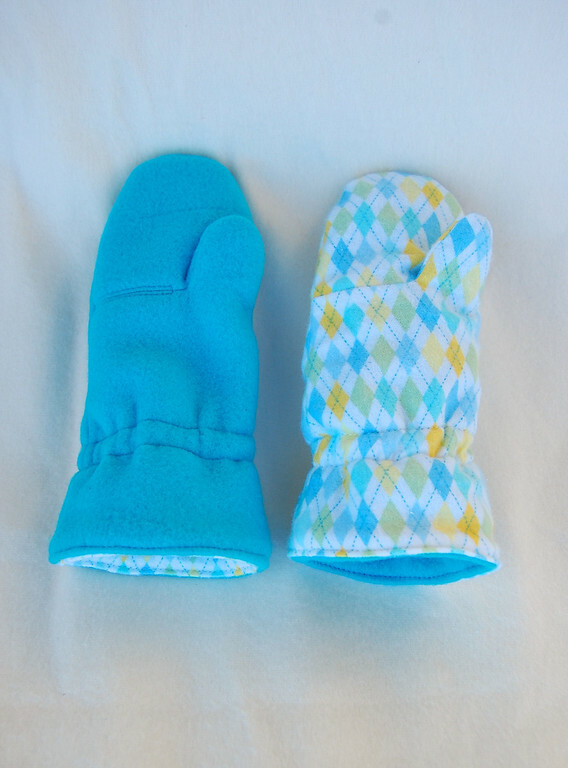 mittens like these are reversible. you could make them in a double layer of fleece. Unrelated to mittens: I am pleased to report that, uncharacteristically early, I have gotten started on Halloween costumes! The sewing room, however, looks like a bomb went off - there's satin and fleece and crushed panne and a particularly hideous olive-green paisley-type home dec fabric (it was cheap) and sharp cutting instruments everywhere, along with patterns made from all variety of paper, including newspaper. And large plastic bags of more fabric that I kick to the side to get to the pedals of the sewing machine/serger. Elegance - 0; Manic Efficiency - 1. So cute photo's of your girls... thanks for the tutorial.. 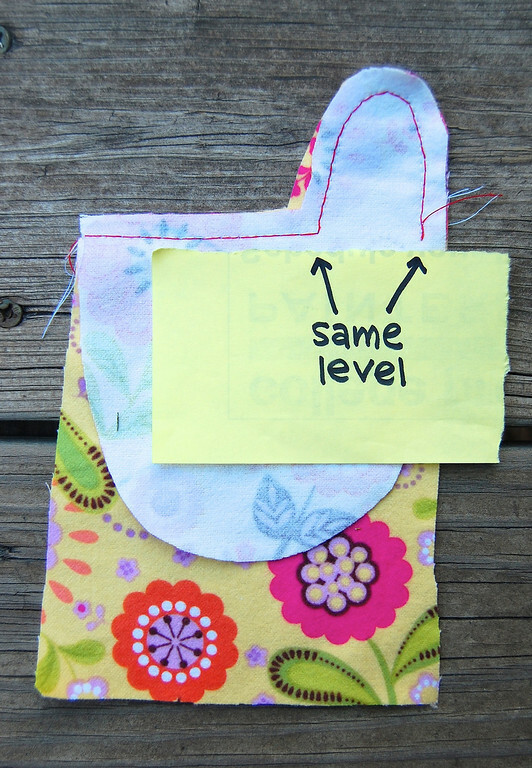 I love this tute....I love that you used the different threads to show the different steps...I LOVE IT all and am going to make mittens right now! Not only does your post remind me of the craziness that is in my sewing room, but it reminds me of a comment made by a fellow weaver years ago. "You could refinish this bench to match your loom, or you could use the time to weave." I love the idea of lining the mittens, and it occurs to me that making 2 sets of mittens that are otherwise identical would help a lot with the missing-one-mitten problem! 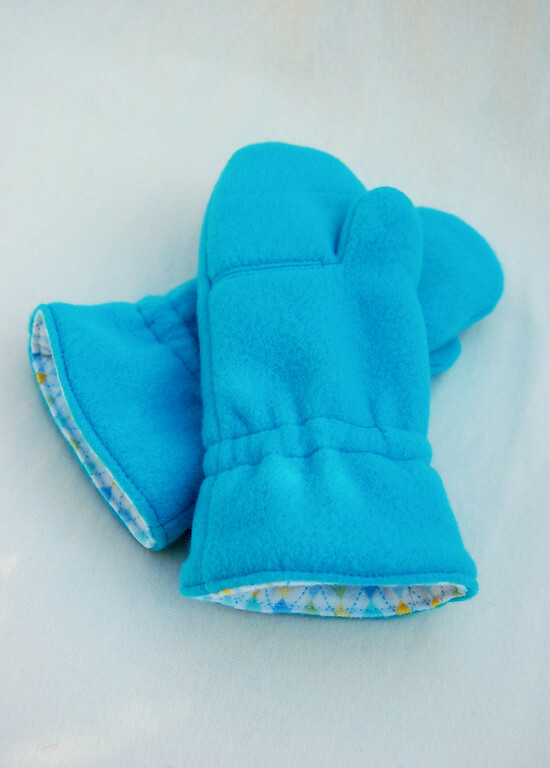 My kids, alas, are beyond these mittens. My husband and I are not too old, however. Funny how that happens, huh? I love the fleece & flannel combinations you chose! Kudos for getting them done at the start of mitten weather. I have some very autumnal corduroy earmarked for a skirt but I have a feeling it may be February before it gets finished. I love them! And your model is so adorable, as always. Can't wait to see the Halloween costumes. No doubt they'll be fabulous! Great tutorial & your mittens turned out so good looking! Thanks for sharing. This is great! Thanks so much. Love the fabric combinations. Thanks for the tutorial. 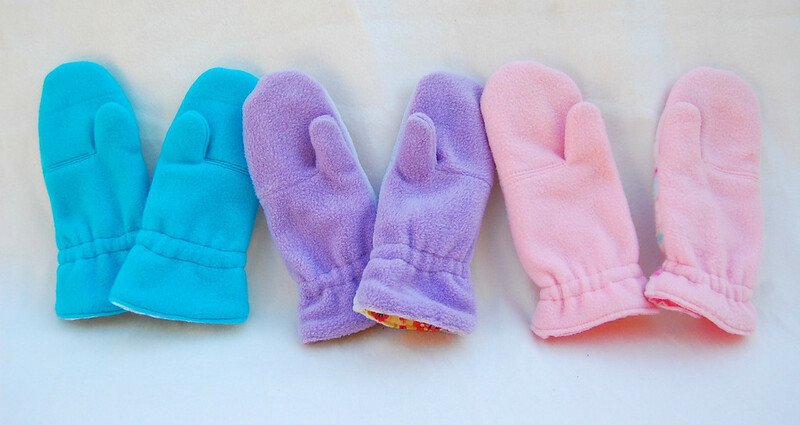 I love wearing mittens...my fingers don't stay warm in gloves...so I'll be making these for myself! 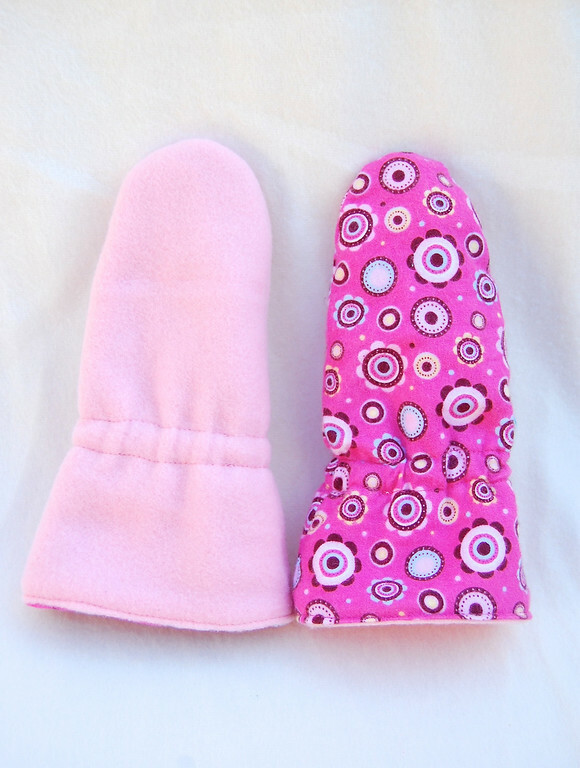 I've been wanting to make mittens, but I am blown away by the level of thought and design that went into yours. Thanks for the detailed directions (and sewing with different colors!). I'm going to attempt it, I think. Wow! This tutorial came at the perfect time...Thnks SO much for sharing this one.... I can't afford to buy new mittens and scarves this year, and this is a wonderful way to use up some fleece I have in the cupboard. Wonderfull!!! Thank you fot the tuto! Super!!!!!!! They are lovely!! Thank you very much! Thank you for another great pattern! 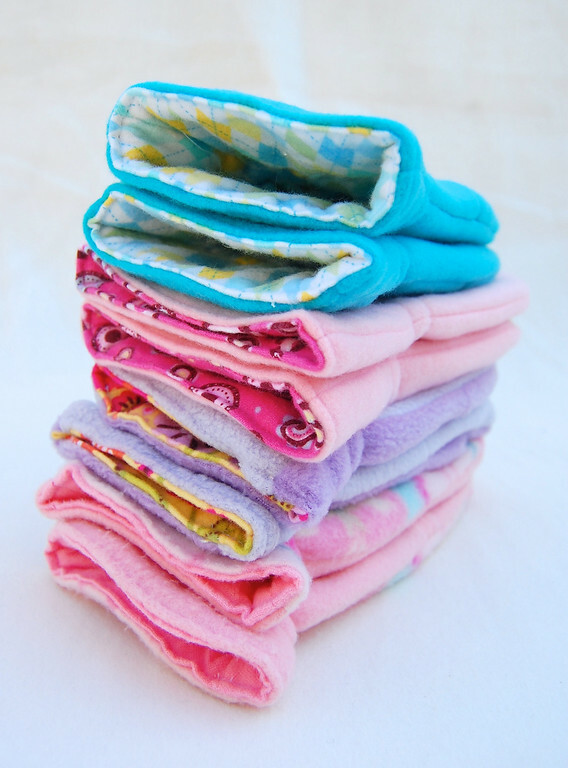 I'm going to make these with recycled sweaters (I just can NOT use a cotton fabric in a mitten). 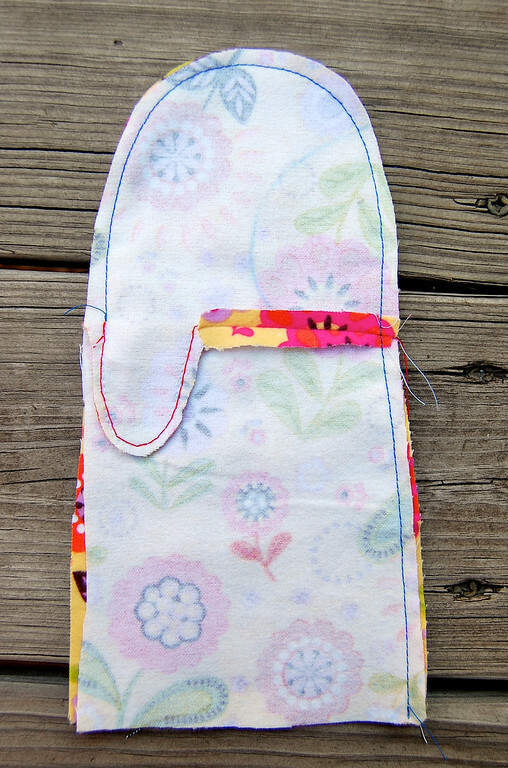 I'm thinking I might sew the elastic on flat, instead of doing the casing. Does that sound possible, or would it create other problems? I love the reserveable aspect! Just wondering why the turquoise and pink ones have extra stitching on the seam on the palms? TracyKM: Not sure what you mean by "extra stitching" - do you mean the topstitching along that palm seam? If so, your guess is as good as mine. And I'm guessing that they're all meant to have that extra pair of topstitching lines but I was too lazy/forgetful to include them in the step-by-steps. It doesn't matter if you have them or not - they're purely for decoration. I'm thinking of making these our ot fur lined sheep skin with a covering of water proof pul (diapering fabric). I think I will extend the outer covering up the arm more with the elastic at the end to be used over the coat or tucked in. I can add an adjustable velcro strap around the wrist on the outside. I really like your pattern, maybe I can also try wool sweaters for the lining as they wick moisture from sweaty palms. 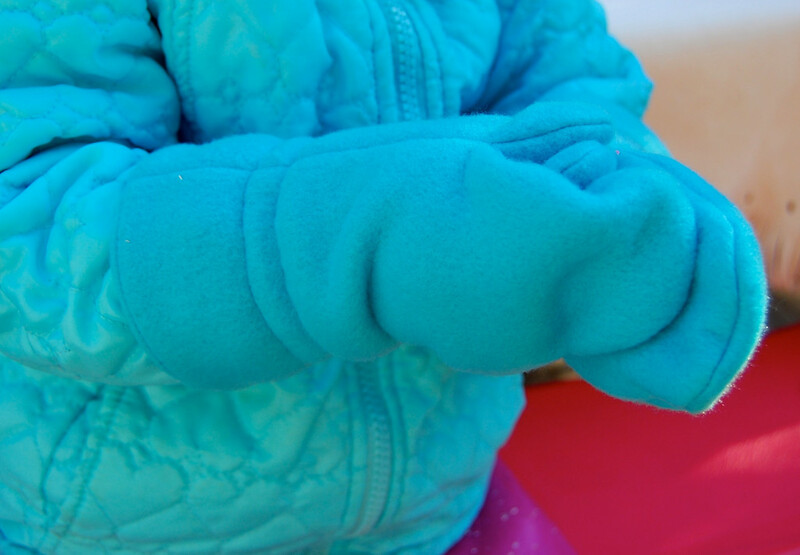 Im hoping I can come up with snow gloves my toddler can keep on. found this in your archives - woohoo! Just what I was looking for to use up an old shrunk wool sweater for my little one ;) As always, thanks so much for sharing with us! I just came across this tutorial and had to say THANKS! I just completed a pair of felted wool mittens for my 2 yr. old grandson, Wrigley, following your wonderful directions. They will for sure keep his little hands warm during our cold Minnesota winter! Thank you for sharing and for making these so easy to duplicate. I thought this looked great but I'm trying to make them and it's the hardest thing I've even done!! How on earth do you sew straight lines for the casing when you can hardly see or move the fabric?! Well I eventually did it but now can't thread the elastic through. I am near giving up. It's just so fiddly and I can't get the safety pin with the elastic on to go through the casing where the seams are. Arghhh!!! Tell me I'm doing it wrong! Also Step 12 confused me because you say to sew on the fleece side, but the photos are of the lining and the fleece is inside the lining....??! Anonymous: whenever you are sewing around a tube or cylinder, you can do it two ways. One is to use your machine's free arm attachment and stitch around the outside of the tube. 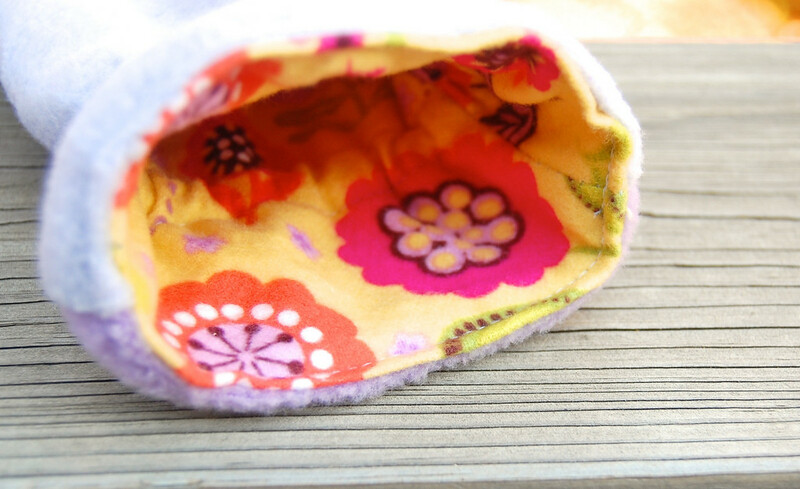 The other is to sew on the inside surface of the cylinder. The first method works only for tubes big enough to fit around the free arm. The second method works for tubes for all sizes, and especially narrow tubes. 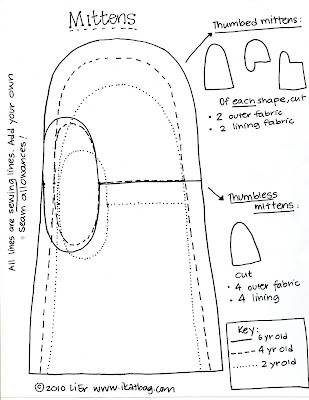 In Step 12, we are using the second method - so, leaving the mitten flannel side out, sew on the inner (fleece) surface i.e. 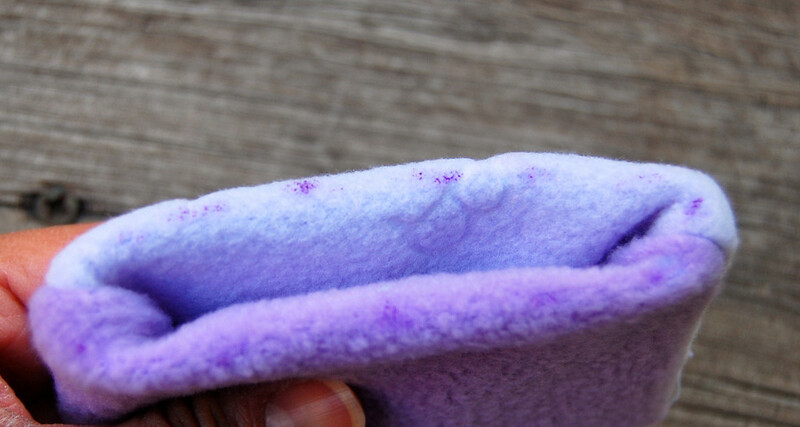 the fleece surface touches the presser foot and the flannel surface touches the throat plate. These mittens are way more work then they are worth. I worked on one mitten for an hour and finally gave up. Th sewing is the easy part. Getting the inside to match up and lay flat was impossible. I trimmed it down to the seam as much as I could and it was just way to bulky. These are not worth the hassle to make. Excellent instructions and photos. Thank you!